This photo does not show the powered bottom. The control panel will have another cord going to the bottom. Model JD23V-3-PB Jupiter Automatic Kiln with with Multi-Program Two-Zoned DynaTrol mounted in a separate easy-to-maintain control panel mounted on the kiln (which fires cool because of the air space between the controls and the kiln). Sectional and modular construction allows future expansion. 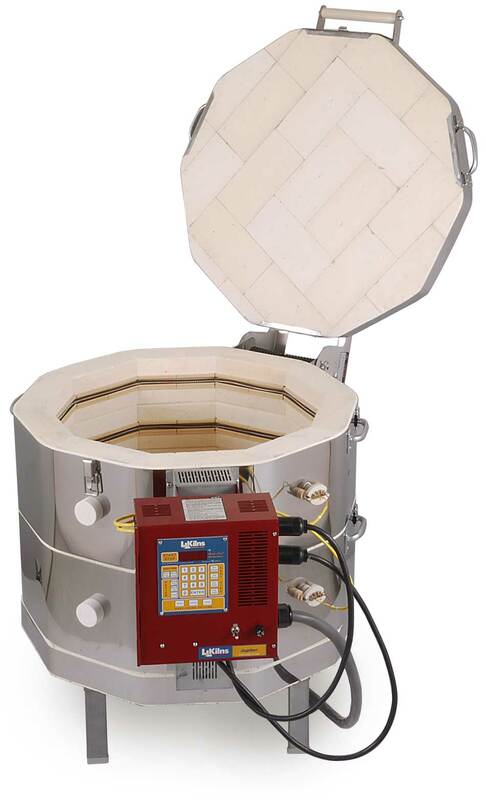 Kiln comes with easy-lift spring hinge, hard ceramic element holders, thermocouple protection tubes, strong solid-top stand, and solid peephole plugs. 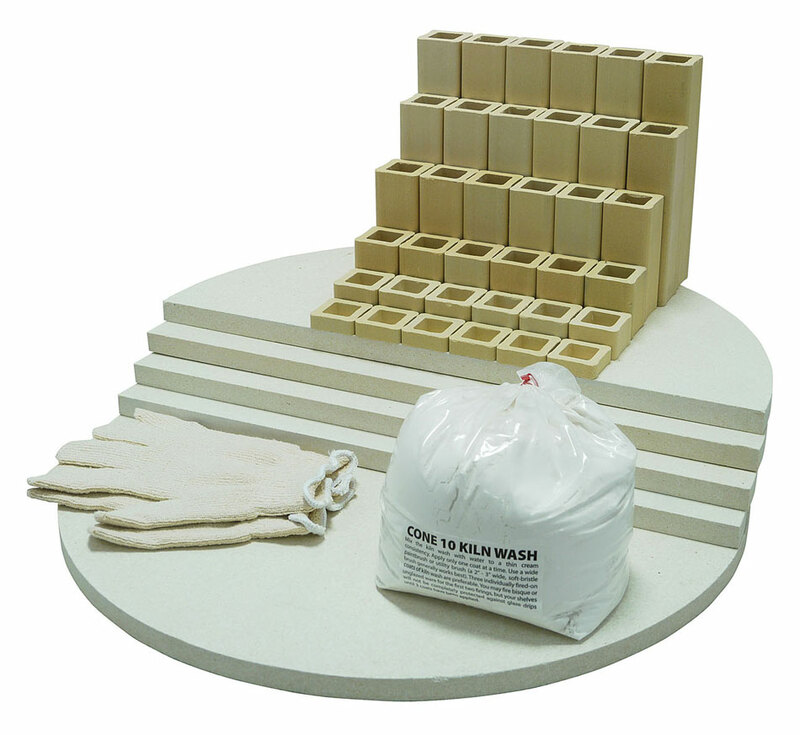 22-3/8" diameter by 18" high (4.5 cubic feet). 3" K23 brick. Includes a powered bottom that operates from a separate adjustable circuit on the DynaTrol. NEMA 6-50 single phase or 15-50 three phase 6 foot power cord included. C-MET-us listed in the USA & Canada. Cone 10 for all voltages. Construction: Stainless steel wrapped around shaped firebrick. There are three adjustable clamps welded to each casing. All assembly is with stainless steel screws. The kiln sections sit on a separate stand. Hinge: Spring loaded "Easy-Lift" lid opens with a feather-lite touch. The strength of the hinge allows the lid to rest back away from the opening without a support arm that would get in the way of loading the kiln. Stand: Heavy-duty 14 gauge full solid stand with multiple bends for strength. Legs bolt on with heavy 1/4-20 stainless bolts. The metal is aluminized for good corrosion resistance. 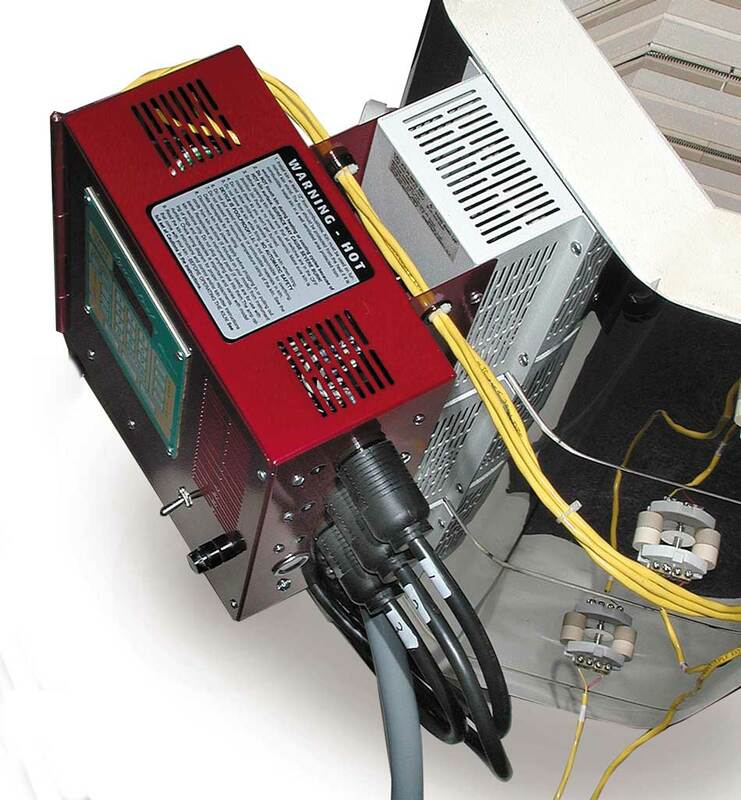 Control Box Mounting: All controls and components are mounted in a separate control panel that is mounted to the element connection boxes with an air space in between. The control panel is hinged for easy access and maintenance. 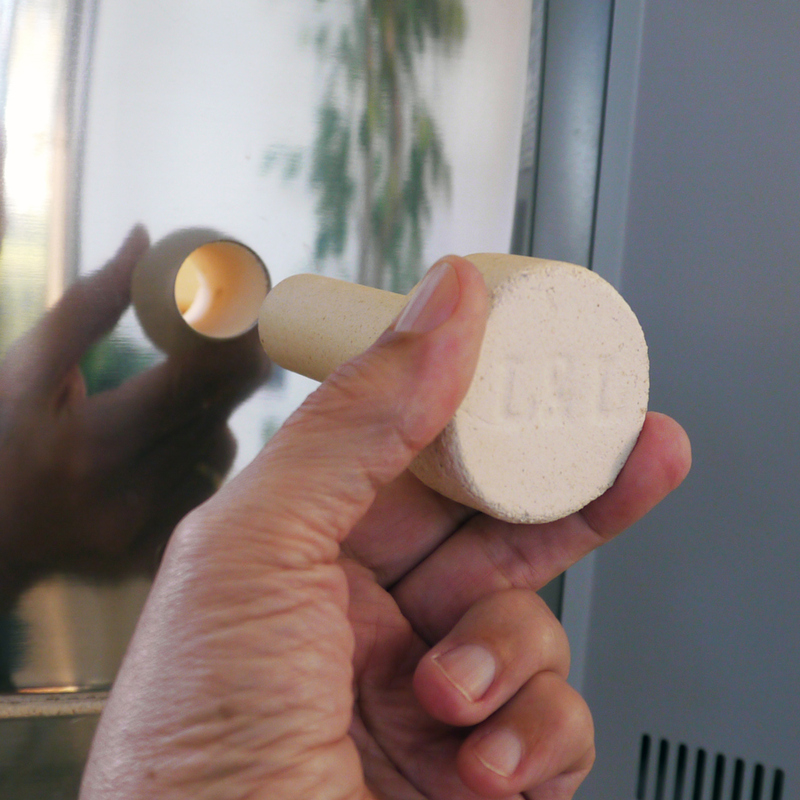 Each kiln section plugs into the control box. Control box can be easily removed for servicing. On/off switch and control fuse are included. More about Jupiter plug-in control panel. Control Panel Service: Control box cover is hinged for easy access to inside of control box. Entire control box is removable. Aluminized stands are extremely strong and corrosion resistant. 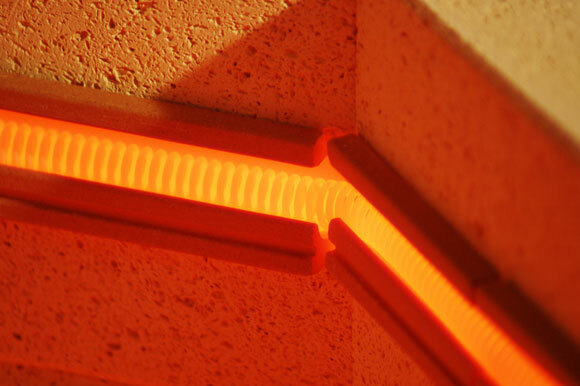 The offer solid support under the kiln - unlike spot-welded angle stands that are common in the industry. Feather-light spring hinge allows full access without a side support bar - for easy loading. 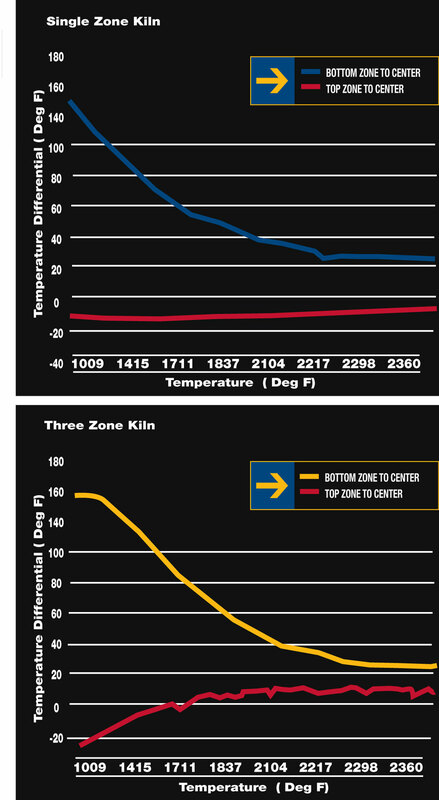 Standard on all 10 and 10 sided polygonal kilns. 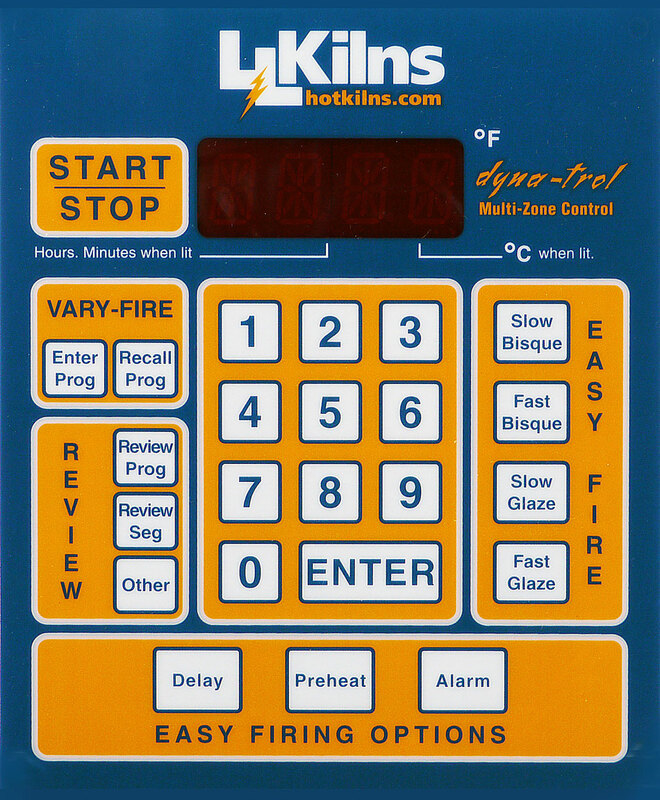 Each kiln sections plugs into the Jupiter control panel. Easy to remove or change kiln configuration. Sectional kiln construction make Jupiter kilns easy to move, set up and disassemble for maintenance. Unpowered rings can extend the height of our Jupiter kilns.